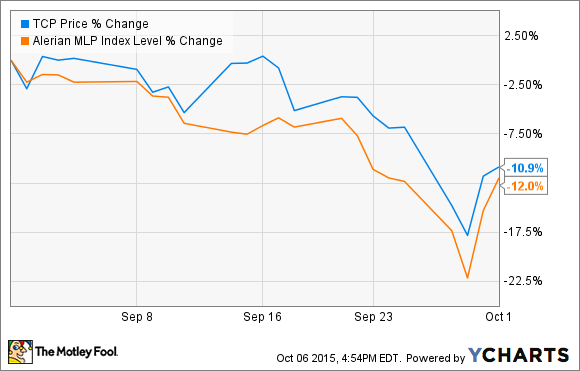 Is TC Pipelines's Stock Plunge in September Something to Worry About? The broader weakness in the MLP space dragged TC Pipelines down in September, but it's lower price does actually mean something to its future growth. What: Shares of TC Pipelines (NYSE:TCP) declined by almost 11% in the month of September, following the rest of the energy and specifically the MLP space as fears of weakening production levels and fears that financing for the oil and gas industry may become a little harder to secure. So What: When you consider that the Alerian MLP Index declined by more than 12% in the month, it's really not that surprising that TC Pipelines followed suit. The big fears across the space for pipelines is that persistently low prices for oil and gas are starting to weigh on production levels, and the need for new pipeline projects may not be as robust over the next couple of years as has been projected. Furthermore, another issue that is starting to raise some eyebrows is the possibility that debt financing might not be as readily available in the coming months. This issue is more related to oil and gas producers as lenders look to re evaluate the credit lines available to companies, but it seems that almost anything nowadays will have some residual effects across the entire industry. For TC Pipelines, the issue of accessing new sources of capital might become a little harder. Over the past year, shares have declined more than 20%, so using new equity as a form of raising capital is less lucrative than it once was. Also, its debt to EBITDA ratio of 5.5 times isn't what you would call a bad leverage ratio in the MLP space, but it's not a great one either and it could potenitally constrain the amount of capital available through debt. Now What: One thing it does have going for TC pipelines is that it's a subsidiary of TransCanada (NYSE:TRP), a company with a much more stable financial outlook and a large portfolio of assets. According to the company, TransCanada intends on dropping down more than $5 billion in US natural gas pipelines to TC pipelines by 2018. The one thing that could make it challenging, though, is how TC Pipelines can pay for those dropdowns. If share prices continue to remain low, it could make those dropdowns more difficult. Another Limited Partnership Cut Its Dividend. Is It a Buy Now?